JB wrote: "We didn't start off with a realtor due to previous experiences, we would monitor inventory and if we wanted to see a house we would call the listing agent. Luckily one of the houses we looked at was listed by Joe and Maureen and right away we knew that this was a team that we wanted working for us. First off Joe and Maureen are very responsive at all times of the day and night. No matter the issue they always seemed available for a phone call, text, and email. They are both very knowledgeable of not only the area, but the market, as well as how much a house may appraise for. My husband and I appreciated the input and opinions given from them. Joe and Maureen listened very well to our requests when selling our house (which took 48 hours) and our wants when looking for our next house. 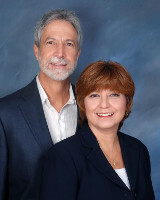 Joe and Maureen never missed an appointment or inspection and we truly felt that they had our best interest at heart. We will absolutely be doing business if we ever move, and I would highly recommend them to anyone who wants an ethical, genuine, caring, responsive, and thoughtful team! Thanks Joe and Maureen for helping us find our forever home......"
CR wrote: Joe and Maureen were excellent to work with. I was purchasing a home in Florida prior to my relocation there. I was navigating the process while in another state. Joe and Maureen were extremely helpful and responsive in closing on a home in less than 45 days from offer. I couldn't have achieved that goal without their assistance and guidance. I would not hesitate to recommend them to anyone. LL wrote: "I have been using them as my real estate agents as of 2008 when they helped us purchase a home. Since then they have been a wealth knowledge and guidance for us. They are very trustworthy and knowledgable professionals. I HIGHLY recommend!" MD wrote: "Thanks you so much. I really appreciate all your efforts & completing this transaction for me. You made it quick and easy which could not have gone better from my prospective. I know my availability wasn't always helpful & I really thank you for your patience and working with me." JM & KM wrote: "Joe & Maureen went above and beyond what anyone could expect. I would recommend these agents, very efficient, professional and easy to work with." TL wrote: “The Mignone's were wonderful, professional & knowledgeable. No question or concern was too insignificant or too small; they addressed all concerns and walked us through the process beginning to end."